Our DDESB TP-18 compliant digital UXO Tech work hour log book, expanded to include Certificates, Training and Health documents and expiration alerts along with an easy ability to send up to date resumes. on-demand standardized live-updating resumes including certifications. Build your resume and work history. Realize live updating resume functionality as you add work logs through your Lincoln Logs app. This video demonstrates how to use the navigation tabs on your individual Lincoln Logs account. This will help you generate your Lincoln Logs resume and familiarize you with the functionality of your account. 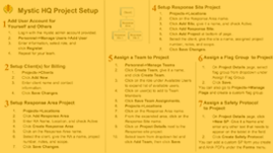 Profile, Logs, Alerts, Supervisor, Job listings, Resume and Help tabs are explained. This video will demonstrate how to fill out a work log and submit that work log at a later time. This will allow you to keep track of all of your hours until a supervisor is able to sign those work logs. No paper logs, easy, convenient and stored in a secure AWS cloud. This video will walk you through the entire process of how to add a work log to your phone app. Allowing your supervisor to sign that work log on the spot. This video will demonstrate how to send a resume from the Lincoln Logs phone app. Providing immediate Qualification, Certificate, Employment data to your employer or prospective employer. No paper, easy, convenient and stored in a secure AWS cloud. This video will show you how to capture images of your critical work documents, such as your Medical, Education and Training Certificates or any other required documents, that you would like to become part of your resume package. Maintain your work history; qualification records, medical certificates, education documents. This video will go through the process of generating and submitting a work log to your supervisor for approval via an e-sign request. No longer need to get your logs physically to your supervisor! Wherever the supervisor is, you can push a request and obtain the required signature through e-sign. Mystic HQ is the nerve center of the Mystic Product suite. Designed to support UXO, MEC, EOD, HMA, Dive, WRA and biological or environmental projects. Mystic HQ allows 3rd party QA oversight when needed and gives program managers full project control while eliminating tedious data collection, collation and data entry errors. Mystic Patrol is the operational arm of Mystic HQ. Downloading a Mystic HQ generated project plan to your Mystic Patrol field device gives team leaders the ability to collect GPS locations, plant virtual flags, capture images, keep daily activity logs, fill out digital forms and maintain a digitally signed log of field briefs (safety, tailgate, hazard analysis). 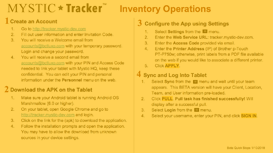 Mystic Tracker is the equipment organization tool that provides easy access to all of your inventory information in the palm of your hand. Gear inventory, status, reorder schedule, custody tracking all integrated within Mystic HQ and with photographic, QR code, on site notes and location capabilities. Mystic*Patrol is the operational arm of Mystic*HQ. 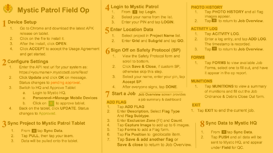 Downloading a Mystic*HQ generated project plan to your Mystic*Patrol field device, gives team leaders the ability to collect GPS locations, plant virtual flags, capture images, keep daily activity logs, fill out digital forms and maintain a digitally signed log of field briefs (safety, tailgate, hazard analysis).